Aud Sentiments Challenge #59 Reminder - Tag It! Hi everyone, welcome to the next challenge at Totally Tilda, but first I must say thank you to everyone who joined in with our Sea/Seaside challenge. Wow what fabulous work ladies, you are all so creative. and of course our darling Tilda. I have used the Have a SUNNY day sentiment from the Summer Memories collection and Tilda with Sunflower from Autumn 2008. I have coloured her with Promarkers and used a die cut from my boss!!! Susie thank you hun. I have used some bakers twine wrapped around the die cut on the left side. The swirls are a Marianne creatables and the tag is a Spellbinders die. the butterflies were a stamp but can't remember where from!!! I have used a gold sakura stardust pen for the faux stitching around the large die. The flowers and charm were from my stash. Don't forget to visit the Totally Tilda challenge blog for some more fantastic inspiration. Everybody Art Challenge - Summer. what beautiful card Ali love the colours and your gorgeous design, those papers are to die for, love them. Love your Tilda card, the butterflies are so pretty, love the die in the background too and the lovely flowers. 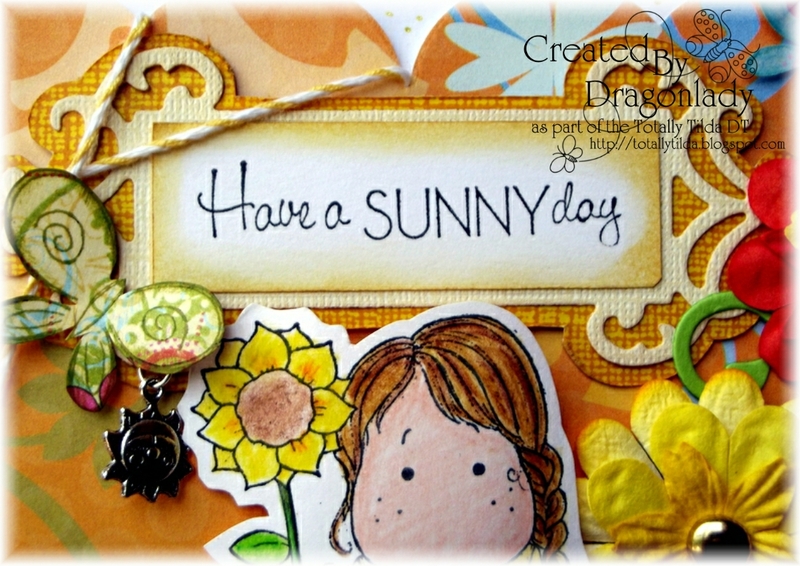 What a fabulous summer card! Thanks for joining us at Di's Digi Designs this time. Hope to see you again soon! so stunning.i love your bright colours and gorgeous image and details. Your creation is beautiful, thanks for joining lovely hanglar or sweet Magnolia. 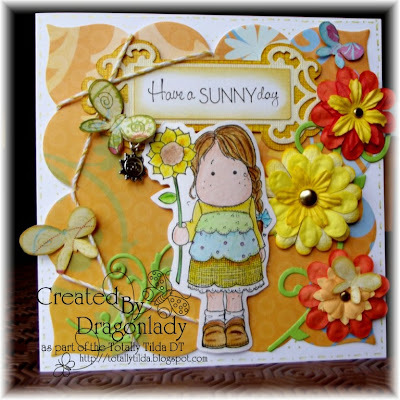 Such a wonderful summery card, woulderful details and I love the sweet Tilda and the wonderful details.